Seal Rock is located in Oregon. Located about 13km south of the wave energy facility proposed for Newport, this site consists of a long rock outcrop surrounded by an extensive sandy beach with frequent high wave energy. A well-maintained, short trail leads from the road to the beach. This is a site visited by researchers from Oregon State University. This steep site consists of moderately uneven terrain, containing few cracks and folds. Seal Rock is dominated by consolidated basalt, and the area surrounding the site is comprised of a mixture of consolidated bedrock and sandy beach. The primary coastal orientation of this site is west. 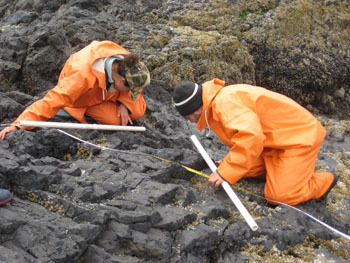 Biodiversity Surveys were done by University of California Santa Cruz in 2013. The Biodiversity Survey grid encompasses two sections that are approximately 15 meters (along shore) x 10 meters (seaward), and 12 meters (along shore) x 10 meters (seaward). Click here to view Biodiversity Survey findings at this site. For more information about Seal Rock, please contact Pete Raimondi.